Starting from the border town of Bad Bentheim in Germany and walking at a leisurely pace along the historic Marskramerpad route or Peddler’s Way for four days will bring you across the border into the medieval Dutch city of Deventer. It seemed a promising destination for me after seeing writer Matthew Stadler’s book of the same name on the table of Amsterdam’s San Serriffe bookstore earlier this year. With high expectations having followed Stadler’s career as a guerilla publisher, journalist, editor, and all-around creative thinker and writer, I anticipated something extraordinary to emerge from the commonplace. Stadler is known for his sensitive appreciation for what is often overlooked, both in architecture and in literature, and this is one of the motivations behind his founding Publication Studio in 2009. They “help writers and artists find their public,”1 publish eBooks and print on demand, which they believe helps generate interest in underserved “publics.” Though Deventer is not under the Publication Studio imprint, it shares many of the same values; it is a conversation and is clearly born out of social exchange. It’s worth noting that Stadler doesn’t naively propose that personal and professional interactions are without complications, and his article “Don’t Take Any Jobs” published some years back in the Canadian magazine Fillip 6 in 2007, and reappearing (in part) in Deventer, uses humour to counterbalance any idealistic notions about collaboration that might seem intrinsic to his publishing practice. Deventer, the book, appealed to me by its title alone, and produced a comparable reaction to ordering a book to be printed and bound. Thus, even before having glanced at the first page, I began my own journey to Deventer, making a small pilgrimage from Bad Bentheim on foot. I did so partly out of my general curiosity about the transition from Germany to the Netherlands, but even more so because I wanted to know what Stadler had to say about the area. Structured as a non-fictional “novel” set in the Dutch architectural and cultural landscape, the form offers an unconventional and highly personal approach to writing on architecture. 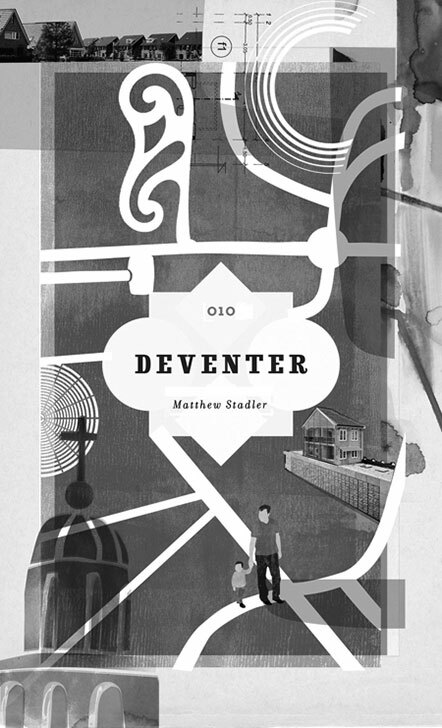 Stadler’s quasi-novelistic endeavour demonstrates the working methods that he admires in the writing of his colleague, architect Matthijs Bouw. One of the most prominent figures in the narrative, Bouw tells Stadler that writing is part of his design process and that he writes to understand and give form to architectural problems. Self-referentially, this book problematises its own medium, blurring the lines between novel, documentary, architectural account and autobiography. Historical background information – such as the significance of Frisian terpen [small, island-like mounds], and technical explanations about local zoning laws and minute-by-minute accounts of city-planning bidding wars –comes up in conversation between lunch meetings and cozy drinks at the bar. But while the account of the property battles and personal interests revolving around the future of an obsolete hospital campus in Deventer begins to take shape, the book, which has neither an index nor a bibliography, loses some clarity and validity as a reference precisely because it claims so many forms. One more thing is clear: it is not meant to be an in-depth look at the city of Deventer; to that aim, visiting the city will suffice, and getting there on foot, while a rather pleasant experience in mid-summer, is certainly not the only way. Stadler’s personal perspective is at once appealing and distracting. He intelligently questions the values held by prominent architects and city planners in the Netherlands, hypothesising that, “If architecture finds itself steadily eroded by a rising tide of engineers, financiers, and bureaucrats, it may simply be due to the profession’s inherent resistance to technique.” This tidal metaphor for architecture is understood on a human scale and “stuck with its humanity.” In a similar tone, he makes illuminating references to his influences and inspirations, most notably social reformer and writer Ivan Illich and the notion of the “conviviality of scale,”2 emphasising an attention to scale and asking how relationships across scale can be convivial or not. And he introduces prominent Dutch Architectural firms including NL, Steven Holl Architects, ONE, Rem Koolhaas and OMA, and others, but annoyingly decides to give pronunciation guides for every single word that is not in English: “Matthijs: ma-TICE (rhymes with ‘ice’).” Though this might be helpful for some North American readers it has an overly didactic feel that soon begins to grate. If anything, it serves as a constant reassertion of how foreign everything still feels for Stadler. Amusing accounts of the author’s literary pursuits in Groningen back in 1988 create autobiographical texture with psychological dimensions that are reflected in his analysis of architecture: he states that the essential resources for an architect are power and hope and goes on to reflect further on the twinned pair of hopelessness and hope. But unlike the tides that have a steady rhythm and reason, these oscillations between the personal and the historical, the minute details and greater global theories, suggest that this book would have found an even more suitable form serialised in installments, especially since the writing often takes a journalistic tone. Formal aspects aside, Stadler is at his best while asking the bigger questions: ruminating on the value of buildings, the meaning of architecture as a general concept, the profession of architecture, and most importantly, what architects do. He gets some unusually sincere answers by doing what we all do in foreign countries: asking the obvious questions of the people who usually don’t get asked. 1. For more information see Publication Studio’s statement on their website at www.publicationstudio.biz. 2. Ivan Illich elaborates on this concept in Tools for Conviviality (New York: Harper & Row, 1973).